It’s the year 1992, and the Triad is raising havoc in the streets of Hong Kong. You take the role of a former police officer out seeking vengeance for his partner who was brutally killed by the Triad. 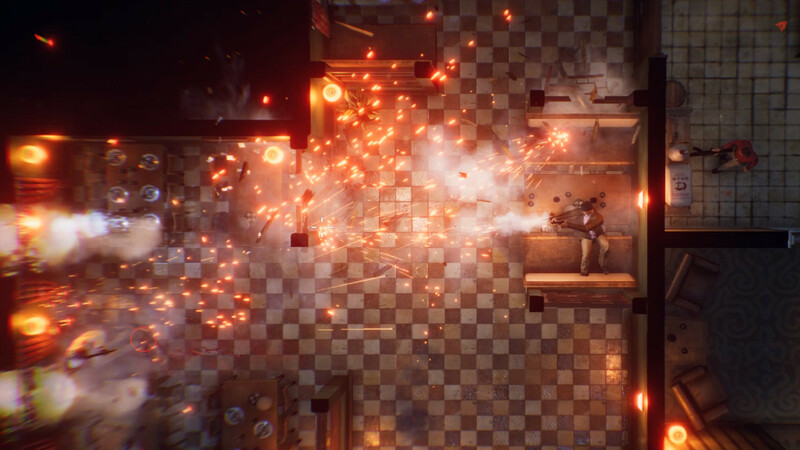 You now know enough to start playing The Hong Kong Massacre, a new top-down, twin-stick shooter which takes its inspiration from Hong Kong action movies. The Hong Kong Massacre is developed by VRESKI, a two-person team located in Malmö, Sweden. We met the team at Gamescom 2018 and got a chance to play their game. Since this is one violent game (I mean, there’s “massacre” right there in the title), the devs chose not to display it on a huge TV for all to see. Instead, had to experience it on a smaller PC monitor, which was a bit of a shame. Although the developer warned me about the game’s difficulty and suggested I concentrate on just playing it, I couldn’t stop myself from asking him questions while suffering a shameful defeat time after time. Eventually, I decided to take the developer’s advice, and I was able to finish the demo. Well, almost finish it… I got through the first level. The Hong Kong Massacre, in its current state, is very challenging, but also very satisfying. With each death, you’re overcome by the desire to smash the remote into the screen, pick up the pieces and retry until you get it right. The dev team is considering adding more difficulty levels to the game but implied this might not be so easy to implement. They want players to be able to choose the level that suits them the most, but also find ways to make sure it’s the right level for them – not too difficult, but more importantly, not too easy. In The Hong Kong Massacre, every bullet counts. It only takes one shot to kill an enemy, but the same is true for you. To survive this carnage, you will have to aim carefully and use bullet-time. Bullet-time looks the same as it does in games like Max Payne – you can slow down time for a few seconds to dodge bullets and fire at multiple enemies. If dodging actual bullets isn’t exciting enough, the game lets you do it in style, jumping through windows or over covers while doing elaborate flips, slides, and rolls. Every map will have us facing not only enemies but also challenges. Upon completing these challenges, we will unlock new weapons and equipment. In the demo we played at Gamescom, only four guns were available, but a full arsenal of 10 weapons will be available in the final game. You will also be able to loot weapons from dead enemies, which this is crucial as you cannot reload and ammunition is limited. Overall, The Hong Kong Massacre feels like a challenging top-down shooter. I enjoyed playing the demo and can only hope the full game will be even better. It does have a lot of obvious similarities to Hotline Miami series, but the great visuals and game mechanics give it the upper hand and might be more attractive to action fans. The Hong Kong Massacre is coming to PlayStation 4 and PC later on this year, and the devs say that we might even see a Nintendo Switch release in the distant future.